One of the most alluring aspects of legal sports betting is the potential to make a career out of it. Anyone who’s ever had any luck on the ponies or in the sportsbooks or at the card table can attest to the desire to go pro. Of course, it sounds a lot easier than it actually is. Generally speaking, the world’s most famous bettors haven’t always lived glamorously, nor have their professions been altogether stress- and drama-free. Just look at (cough, cough) Doc Holliday. For a long time, it was Doc Holliday’s downward-spiraling, degenerate persona that most aligned itself with the idea of professional gambling – a seedy calling in shady places, the office a smoke-filled den of booze, drugs, and dirty double dealings. Anyone who became a professional gambler ran the risk of drawing Eights and Aces at any time. It just wasn’t a respectable, gentlemanly job. You only turned to the parlor when you had nothing left to lose. Of course, that’s the myth aspect, and it really is just a fun fairy tale. The reality is that the world’s most famous bettors – the people who have set the standard in the modern public psyche – are basically just giant math nerds. If these guys weren’t betting, they’d be crunching crazy numbers and running advanced models at some Wall Street firm or yammering endlessly about sabermetrics and comic books on ESPN. Sure, they’ve got ice in their veins, but for the most part, they’re just numbers-obsessed adrenaline junkies and sports fans chasing a thrill. If you want to know about famous bettors, you’ll want to know about Billy Walters. He holds the distinction of having “bet more money more successfully than anyone in history,” and he holds it closer to the vest than you might imagine. The glitz-and-glamor world of high stakes betting never seemed to attract Walters – he often had employees, called “runners,” post his bets remotely. Yes, this was primarily driven by various Las Vegas sportsbooks refusing to do business with the guy, but on some level, the isolation made his analysis and computer modeling even better. But nobody will ever know exactly how some alcoholic used car salesman from Kentucky ever broke his underdog mold to own the sports betting world; in the few interviews he’s given over his 40-year professional life, he’s never been particularly explicit about his methodologies. Walters is estimated to have earned roughly $300 million by taking on the stock market, real estate risks, and epic sportsbook gambles. 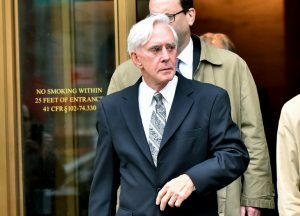 The feds badly want a piece of Walters’ success, but so far they’ve been unable to find any evidence of wrongdoing at any stage of his career. Statistically speaking, there’s no explanation for Walter’s success. Everyone just assumes he broke science. And everyone knows he broke a heck of a lot better than even. Read Billy Walters Sports Betting History here. Jimmy Snyder, a.k.a. 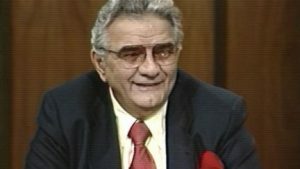 Jimmy The Greek, was a celebrity bettor, Vegas bookmaker, and television sports commentator. Though his career was mostly lauded due to his magnanimous demeanor and his comical claim that he bet against Thomas Dewey to win the US Presidency because he had a mustache (which, apparently and inexplicably, he decided ladies don’t like), he was ultimately panned and canned by CBS for saying some old-man-style-innocuous-but-decidedly-non-PR nonsense about different “types” of athletes. It was probably the worst bet of his career, and he wagered – and lost – his longtime gig on CBS’ Sunday morning show The NFL Today. Still, whenever you hear guys on the TV tell you what the specific final score of a given football game will be, remember Jimmy The Greek. He started that to sidestep the “taboo” of positing sports spreads on national television. 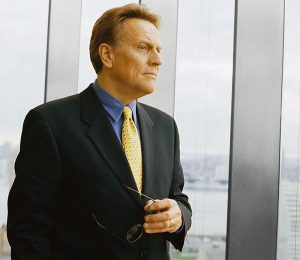 The guy was truly a pioneer that pushed sports betting into the American living room. Read Jimmy The Greeks Sports Betting History Here. Bob Voulgaris is, by all modern accounts, the most prolific and successful NBA bettor on Earth. 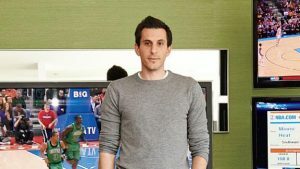 In the late 1990s at the age of just 25, Voulgaris was reportedly flipping a million dollars a day on basketball games. His most famous and profitable “edge” was in taking advantage of the unsophisticated way NBA bookmakers of the time predicted halftime scores. Since they rarely accounted for the aberrant burst of scoring in the fourth quarters of games, the industry standard was to take the presumed final score and merely cut it in half. That made it easy for Voulgaris to pounce on predictions that were far too high at the half, and it is thought that he made tens of millions of dollars during his peak. (Once the bookies wised up, the cash cow dried up, unfortunately.) Though he also relied on the broader statistical sciences of the times, he was also well-known for seeking out the “tells” and tendencies of head coaches Eddie Jordan, Jerry Sloan, and Byron Scott. Unsurprisingly, this style of play lends itself well to poker, where Voulgaris has accumulated almost $2 million in earnings to date. 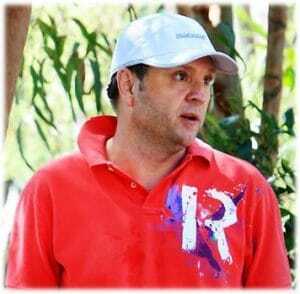 See the Bob Voulgaris sports betting bio here. Unlike the legendary Billy Walters above, Jon Price has a firm background in statistics and a Mathematics degree from NYU. While he is noteworthy for a placing (and then winning – I still can’t believe they didn’t hand Beast Mode the ball!) a million bucks on Super Bowl XLIX and picking the Royals to win the World Series before the 2015 season started, Price operates more on the sports handicapping side of the business. He is also a frequent radio guest on sports beting shows throughout the entire country giving free picks and analysis on the weeks games. John Price isn’t the only bettor-turned-handicapper on this list. 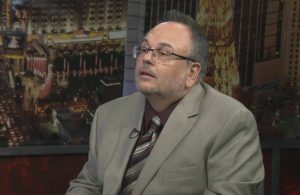 One of the most noteworthy contemporary practitioners of both sides of the coin is one Marco D’Angelo, a Las Vegas resident who regularly posts between a 57- and 58-percent success rate on his sports picks. He once had a run of correctly choosing 25 MLB games in a row, a feat not often replicated in betting circles, and he has a reputation of going with his gut as much or more than he goes with the science and the metrics. While it was Jimmy The Greek who brought the betting line into the average American household, it is Teddy Covers who’s working overtime to make sure it stays there. 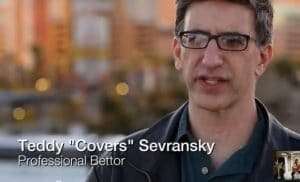 Since the 1990s, Covers has been making and selling picks on a variety of sports matchups through a variety of media, appearing in magazines, newspapers, radio, and television shows. He has the cachet to cash out on his choices because of his acumen in finishing at or near the top in over half a dozen major sportsbook tournaments throughout the 1990s and 2000s, including the Las Vegas Hilton SuperContest, an event that the next guy on the list actually won twice. A math whiz and champion-level chess player, Steve Fezzik made his start as a sports bettor in the 1990s, mainly playing the college football books in Las Vegas. He moved there permanently in 2001, and during the aughts, he won half a dozen high-profile tournaments and pocketed nearly a million dollars. Unlike Walters above, Fezzik stays in the limelight, using his name recognition to push his brand onto the covers of news stories and magazines. In 2008, Fezzik won the Las Vegas Hilton SuperContest, considered by many to be the “World Series of sports betting.” He won it again in 2009, and he remains the only two-time winner of the prestigious event. Maybe Zerj is just staying low-profile in his claims of relative pauperhood, or maybe he’s actually not all that (many billions). Well, either way, this guy is. 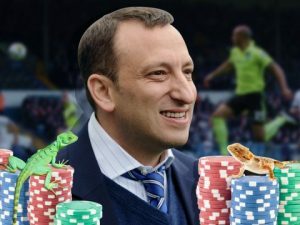 Englander Tony Bloom, like Zerj, cut his teeth playing cards, earning roughly $3.3 million in live tournaments to date. But word is this guy took it to the next level (or three) when he started betting on sports and selling his picks. Focusing primarily on soccer behind the walls of his secretive Starlizard company, which forces its employees to sign strict non-disclosure agreements while allowing them a place in the pool, a bona fide fortune has been amassed almost entirely in secret. If Tony wins, his employees do too, but nobody can know about it. Still, word gets out. And the word on the street is that Tony wins a lot. Like, billions-of-dollars a lot. In reality, the only concrete evidence of Bloom’s personal net worth is the fact that, since about 2009, he’s pumped close to $260 million into his favorite childhood soccer team, Brighton and Hove Albion FC. Which, of course, he now owns. As for whether he also owns the title of World’s Richest Bettor? Well, I wouldn’t bet against him. One of the biggest names in all of sports is Floyd Mayweather, and he also happens to be a huge sports bettor. Floyd has made the news on multiple occasions for his big bets that he has made over the year. Of course he only really tells people about the winners, but they are definitely worth talking about. During the super bowl he has been known to bet over a million dollars on the team he likes. Overall, I would say he definitely qualifies as one of the biggest and most famous sports bettors of all time.